10:47 after going back and correcting two errors. Interesting history of Mar-a-Lago. 8:40 no errors. 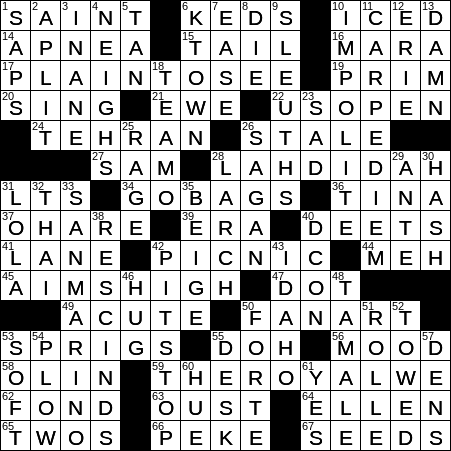 I think my brain was tired after doing the Sunday puzzle earlier. Can you explain why you don’t offer detailed explanations for all clues. In this puzzle there are some 15 across and 16 down clues where there is no detailed explanation. In most cases the summary listin works but on this on I am stumped as to the answer for 34 across Go-Bags – can you please explain. I had not heard that emergency supply bags had a name either, but here is the online definition: “a bag packed with essential items, kept ready for use in the event of an emergency evacuation of one’s home”. I think Bill, justifiably, limits his explanations to what he refers to as his ‘wiki-est’ answers. Those which are most interesting and arcane. 8:32, no errors. Not as impressed with the theme as Bill was. I liked the foreign-language theme and some of the tougher fill. Made Monday more interesting than usual. No errors. An excellent puzzle. Loved it. Bill, I got a chuckle from your musing about what the crossword in The Daily Planet would be like. I had never thought of it quite that way before.